Whisk cream, eggs, rum, coffee, sugar and salt in a shallow dish. Place a skillet over medium heat. Dip bread slices a few at a time in egg mixture, fully saturating both sides of bread. Lightly coat pan with butter. 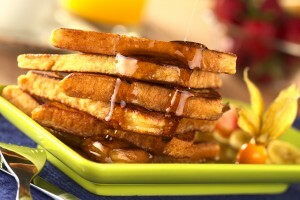 Fit two or three slices of bread in pan; cook about 2 minutes per side until golden brown. Repeat with remaining bread and egg batter. If desired, stir together coffee and powdered sugar in a small bowl; transfer to a mesh sieve or tea infuser. Dust over French toast. Serve with Angostura® bitters Maple Syrup.